In the spirit of multi-cultural books, this children’s book is aimed primarily at children born of parents from India, who may or may not have a chance to visit their parents’ homeland. For children with no connection to India at all, the book may go over their heads, or lack interest. 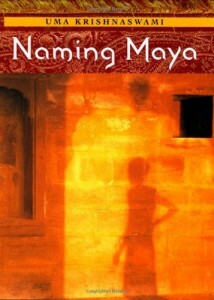 I enjoyed it because it describes life in India quite well, and that always fascinates me. The themes include parents who have separated, and dealing with an aging family member who is facing memory loss. Friendship and loss is also woven in. As a result, the book is very much like an Indian curry, a mix of everything, spiced here and there with foreign words and translations of them. I checked out this children’s book, and two others, because I enjoyed the first one I read by this author, called Book Uncle and Me. However, I think that in the end, her books become a bit too formulaic. This one works, but it is lightweight and has a very select audience. It does deal with children’s issues of divorce and unattentive parents in a clear and compassionate way. It also captures the culture challenges that arise when your parents return to their homeland, but you haven’t actually grown up there.